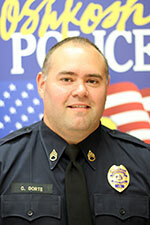 The Special Operations Unit is headed by Sergeant Chris Gorte and is a support unit within the Patrol Division. The Special Operations Unit is comprised of one Sergeant and 10 Community Service Officers. This unit is responsible for coordinating special events that occur in the City of Oshkosh. The Special Operations Sergeant is the advisor to the Oshkosh Auxiliary Police and Oshkosh Explorers.